After a somewhat tedious look at the scientific background to high gravitational (G) forces and how they affect the human body in flight, we need to understand how military aviators flying high-performance aircraft maintain consciousness and continue to press their attack in such a physically demanding and stressful environment. Before we get into that, I need to address the dreaded G-induced Loss Of Consciousness. A significant risk to any fighter pilot’s life, Lockheed-Martin F-16 and F-22 pilots in the USAF are uniquely at risk to G-LOC, given their aircraft being able to initiate maneuvers where rapid-onset G spikes over 9 very quickly. Those particular jets also have the capability to sustain high G-loads for significant periods of time–far longer than the pilot can. Because of such extreme maneuverability and performance, the largest LIMiting FACtor (LIMFAC) is the pilot. A former Viper East (Block 50 F-16CJ) Demonstration Team pilot has said that EVERY time he repositioned the aircraft between maneuvers in his routine, he was hitting 9 Gs on the meter. During certain maneuvers, he sustained between 9.5 and 9.9 Gs. One F-22 Raptor Demonstration Team pilot fairly routinely saw 10.2 or 10.3 Gs at a certain point in his routine. In a word? Painful. 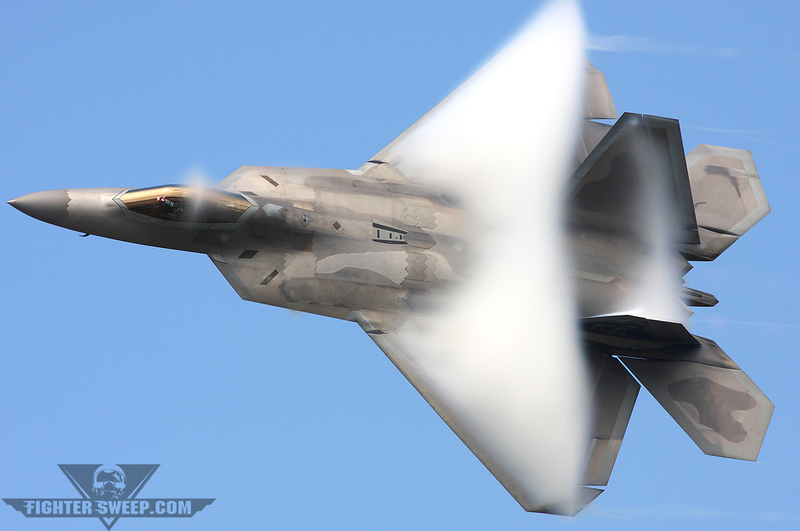 Major Henry “Schadow” Schantz” performs the “Dedication Pass” during his F-22 Raptor Demonstration, a maneuver consistently subjecting him to more than 9 Gs through the entire turn. The combined Class A (loss of life or greater than $2M damage) and E (physiological) mishap rate in USAF F-16s for Fiscal Years 1993-2009 is 1.32 per 100,000 flying hours. In layman’s terms, for that period of time, a pilot died or seriously bent an airplane a little over once in every 100,000 flying hours. A combination of the newer Advanced Technology Anti-G Suit (ATAGS) offering greater lower-body coverage, combined with the fielding of the Automatic Ground Collision Avoidance System (Auto-GCAS) should significantly decrease the number of deaths from G-LOC in military aviation. 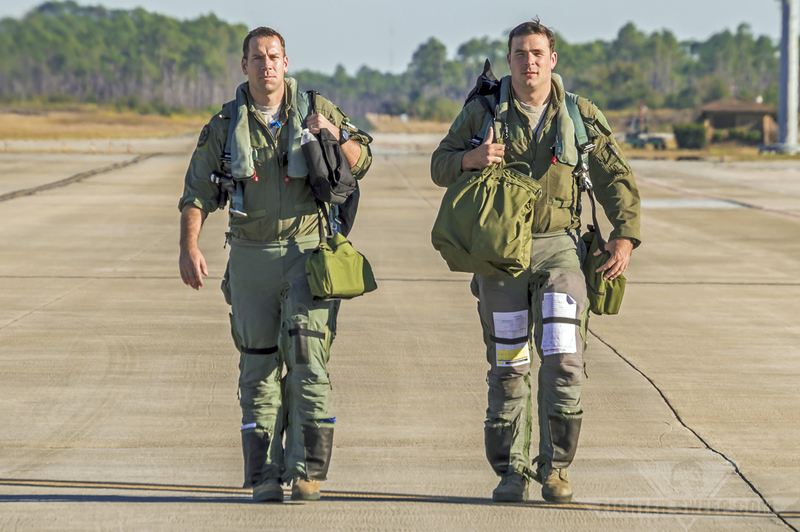 A detailed look at the development of Auto-GCAS and the Pilot Activated Recovery System (PARS) recently installed in all USAF F-16’s can be found here. So what has the USAF done to combat the mishap rates? How are the pilots able to sustain heavy G-loads and still able to employ offensive and defensive systems, maintain their situational awareness by monitoring the displays as well as looking outside–often through helmet-mounted cueing systems (JHMCS and HMIT), all while performing the tasks required to actually fly their airplane?? First developed during WWII (what modern military product, strategy, or weapon wasn’t? ), the AGSM increases aortic blood pressure leaving the heart and ensures the blood is fully oxygenated, which ultimately maintains brain perfusion and pilot consciousness. Remember, ladies and gentlemen, a well-trained, effective AGSM can increase your G tolerance by approximately three Gs! For fighter pilots, the AGSM must become an instinctive habit, requiring no conscious thought. Breathing: Rapid (< 1 sec) exhalation/inspiration cycles every 3 seconds. This maintains oxygen content and decreases carbon dioxide in blood, while also relieving increased pressure of chest, and allowing the heart to refill with deoxygenated blood from the rest of the body. Isometric Contraction: Flexion of skeletal muscles of legs and abdomen. When muscles contract, the small blood vessels in them constrict, making them smaller with less room for blood. This step increases pressure in chest and displaces blood away from these contracted muscles into the upper body and brain. High Gs make the blood heavier and displace blood to gravity-dependent areas (away from your nugget). That is to say, G causes the blood to pool in your lower extremities, especially legs and feet. The brain is highly sensitive to cellular hypoxia (lack of oxygen), so rapid impaired function and almost unconsciousness follows (A-LOC), and then ultimately total unconsciousness (G-LOC). 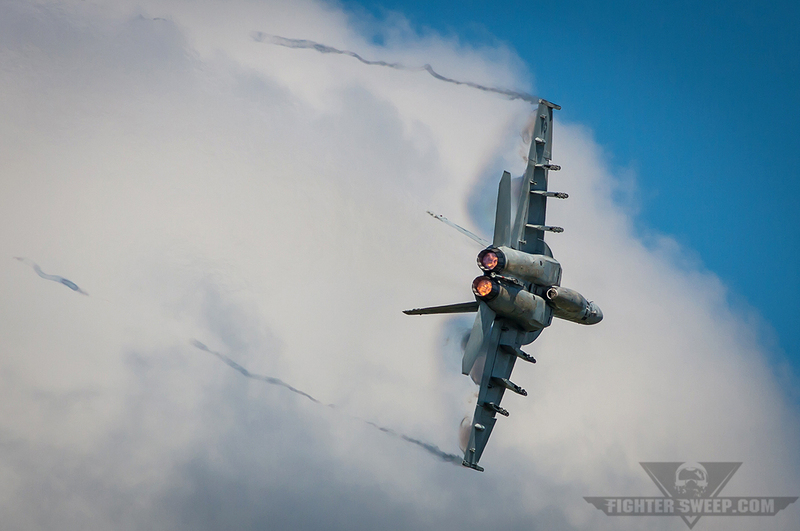 An F/A-18E Super Hornet pulls through a high-G turn during a simulated dogfight for the airshow crowd at NAS Oceana, Virginia. To avoid this, your body will reflexively make adjustments in heart output and blood pressure to increase blood flow to the brain (by parasympathetic response–an adrenaline surge), but it takes 6-9 seconds for this reflex to initiate. By this time, unconsciousness has likely occurred, which obviously means no one is conscious to fly the aircraft. So if you, as a Viper pilot, are looking over your shoulder at the guy trying to kill you out there and you load up your jet with nine Gs and pass out because you got behind in your AGSM, what happens? Simple answer is this: instead of pulling 7, 8, 9 Gs or whatever is required, the aircraft eases off, becomes a 1-G, non-maneuvering straight target, and your life comes to an abrupt end thanks to your enemy’s air-to-air missile, or he rolls in and guns your brains out. Negative G’s followed by Positive G’s will place you at VERY HIGH RISK for GLOC as the reflex causing lower heart output and blood pressure will remain intact and will significantly diminish your G-tolerance. For a short period of time following negative G’s, the body will literally be incapable of constricting the blood vessels and increasing the heart rate. This is called the ‘Push-Pull Effect’ and should be avoided at all costs. If you must maneuver your jet in that fashion to defeat a SAM or a bandit’s gun solution, an ultra-intense AGSM is going to be required to keep you awake–and alive. G-tolerance is influenced by several variables: heart-to-brain distance, muscular strength and endurance, rate of G onset, anti-G suit effectiveness, and body positioning. The F-16 seat is reclined 30 degrees, shortening this distance, thus increasing G-tolerance. The old standard USAF CSU-13B/P G-Suit is thought to provide 1 to 1.5 G protection. The new Advanced Technology Anti-G Suit (ATAGS) reports increases G-tolerance by 2.5-3 Gs and a 50% reduction in G-related muscle fatigue. “Hypr” and “Ox,” two F-16CJ pilots with the 55 FS (Roll ‘Em! ), walk back to briefing after returning from their training mission. Note both pilots are wearing the Advanced Technology Anti-G Suit (ATAGS). ATAGS may prevent more G-LOC than any other preventive measure. If you don’t have the new G-suit, get it! Once you begin using the new G-suit, I recommend you NEVER return to the old G-suit. Your habits will change, your AGSM will deteriorate, and your G-tolerance may diminish. This may increase your risk for GLOC. Muscular endurance: The AGSM is intrinsically fatiguing and is an anaerobic activity. Anaerobic capacity and muscular strength can be increased with training. Focus on the larger muscles of glutes, quads and hamstrings. Conversely, full recovery of high-intensity weight training of these muscle groups may diminish your AGSM for 24-48 hours. Avoid these types of workouts prior to high-G sorties. NO SMOKING: One of the by-products of cigarette and cigar smoking is carbon monoxide. This will diminish your blood’s oxygen-carrying capacity. Having less overall available oxygen will also diminish your G-tolerance. AGSM Technique: Never hurts to continue to review, practice, and brief to what a good, effective AGSM looks like. You are required to complete one annual AGSM HUD review, which may not be adequate. Make it a habit! Nutrition: Just like preparing for a high intensity sport, ensuring that your glycogen (carbohydrate stores) are maximized should ensure that you have the available energy to delay fatigue for the longest time possible. 1. Natural Medicines Comprehensive Database, Consumer Edition. Accessed 27 Jan 2014. Adapted from original content on GoFlightMedicine by Capt Rocky “APOLLO” Jedick. What Exactly Is Auto GCAS?